Massive Audio - BLX5 | BLX5 | Endstufen | Toms-Car-Hifi - Kaufen was Freu(n)de macht! 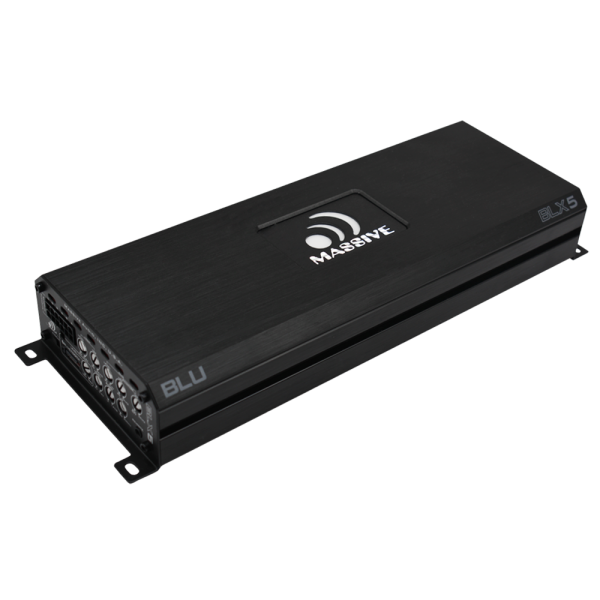 Massive Audio NANO "BLU" BLX5 Amplifier with Bluetooth Audio Streaming comes dressed in a soft blue backlit logo. Powerful but small at only 4.25” W x 1.6” H and 10.86" L The BLX5 uses a 5 channel Digital Platform with a built In OEM Line Converter that can take up to 9V In with Auto Turn On (no turn on wire needed) 12V out and supports a USB which accommodates the optional UBT1 Bluetooth Dongle for audio streaming. The BLX5 has a "Docking Port" to plug in an optional Rail cap Booster (RCLX).